This is a great little gallery that has contempory and traditional art. I'd like them to represent me some day. It was the store that sold the stuff that John Hancock's Wharf unloaded. Eventually it because a central trading spot for all kinds of merchandise. So the spot has history, and art, and lots of beauty. It was a gorgeous day and I did not have the pink chair with me but I decided I would paint anyway, because conditions were so perfect. 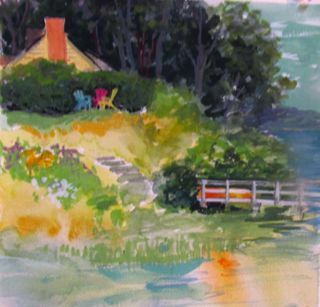 I set up my paints and easel on the wharf (found shade and a great view) and started laying out my composition and getting in a few base undercolors on a small piece of paper. I suddenly did a double take. There, in the upper left of what was going to be my composition, was a pink adirondack chair just like mine, with other colors. It was in the perfect spot for my composition. I literally had not seen any of the chairs when I set up. Did you put it there, Mom? I swear I hadn't seen it at all. As my sister Georgie said, Cool..what I thought of is that the chairs with "Mom" were her friends visiting. She would so much more enjoy a beautiful day with others than alone, right? Well, I gladly painted it in.